Western blot analysis of extracts from U-937 cells, untreated or TPA treated (0.2 µM), using Phospho-PKCδ (Thr505) Antibody. Western blot analysis of extracts from Baculovirus-infected cells expressing PKC isoforms α, β, γ, δ or ε, using Phospho-PKCδ (Thr505) Antibody (upper) or control PKCα, β, γ, δ, ε antibodies (lower). 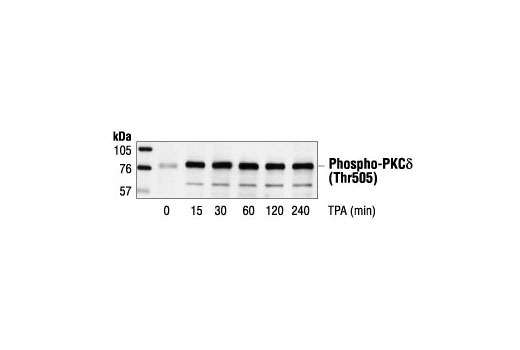 Phospho-PKCδ (Thr505) Antibody detects endogenous levels of PKCδ only when phosphorylated at Thr505. 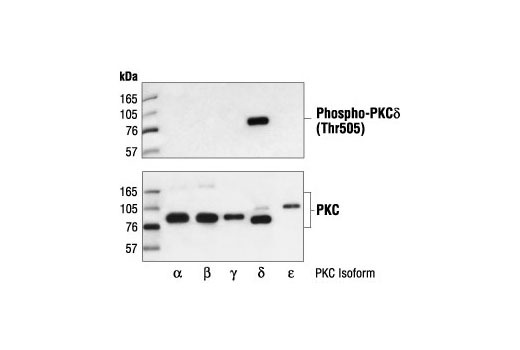 This antibody does not cross-react with the phosphorylated forms of PKC isoforms α, β, γ, ζ or ε.
Polyclonal antibodies are produced by immunizing animals with a synthetic phosphopeptide corresponding to residues around Thr505 of mouse PKCδ. Antibodies are purified by protein A and peptide affinity chromatography.